Living In Aveley 1948 68 - a Memory of Aveley. Hello. I came across this site yesterday quite by accident and was really taken away by all the memories. Here are mine - I was surprised by the names and everything else that came back to me. Forgive me if I don't spell all the names right, I think they should still be recognizable. And I hope there's enough space for everything! Dad - HERBERT (MICK) Newberry - was from a family of about 16(!) kids in S. Stifford (Moore Avenue). Mum - ELSIE Doris Marsden - was from a family in Tilbury (Feenan Highway). The Marsdens were apparently evacuated to Rugby, Warwickshire because of German bombing of Tilbury docks, while Dad served in the Navy. After WW2 Mum and Dad moved back south with me. But what I didn't find out until about 40 years later, I wasn't their child! I was the adopted son of Elsie's sister Connie through a liaison with a US airman. Anyway, we moved into one of the first new council houses in Aveley, at 22 Arnhem Avenue. Dad worked at the Tunnel Cement. My first school was Aveley Infants, down at the end of the village, wonderful with an orchard adjoining. Our first teacher was Miss Pavitt?, also wonderful. Was Mrs BANCE the headmistress? At any rate in a smart brown tweed costume. At 7, I suppose, I moved across to the Primary School, headmaster Mr Moss. In my first year the teacher was Mrs Skeets, then Mr Hampton, and 2 years with Mr Skinner. Other teachers there were Mr Ford, Mr Webster and Miss Southgate. Mr Ford rode a 3-wheeled bicycle, as far as I remember, and in the school holidays cycled from one end of Britain to the other, from Land's End to John o'Groats. Mr Skinner was a great bloke, also keen on sport, and I believe he died of a heart attack at Blackshots while refereeing a football match. I sat next to Douglas FOSTER. After school I sometimes walked home with Janice BARNARD, possibly Jill RIMMER. I joined the Wolf Cubs with Peter CLARK from next door. Mrs STODDARD? was Balou. Bob-a-jobbing was always fun, earning a shilling for running errands, cleaning windows and the like. I went on to Dagenham County High and lost contact with many school friends for a few years, especially as I stayed on into the 6th form. But I got together with them later, always playing football it seems, down at the Tunnel sports ground: Jeff COLLINS, David SHELLEY, Trevor JOHNSON, David WARREN. When we were old enough we were often in the Ordnance Arms (Percy was the publican) playing darts, eating cheese and onion rolls to make us even thirstier. In Arnhem Avenue I remember the GROVE family (Chris and Beverley), the EDGELERs (he was confined to a wheelchair, I think, because the Japanese mistreated him as a PoW. Paul COKER lived on the corner opposite, and his Dad had a three-wheeled car! The LANNIGANs were 3 boys (Ray, Michael and David?) and 1 girl. Oh, and the CLARKs (Peter and his sister Dawn) lived next to us before moving further down. Next to us there were old people's bungalows. The first people I remember living there were the BEECHAMs. A proper military type, I think he served in the Army in India. At one time he had no less than 3 Scottish Collies. Then I went to Nottingham University in 1964 to study German and again lost most contact. After university in 1967 I worked for a while at Aveley Electric in Belhus, and on a few evenings behind the bar of the Fox&Goose in W. Thurrock. Leisure time I spent with Kevin SAVILL because unlike the others neither of us had a car. The publican of the F&G Maurice bought a share in a hotel in Ibiza and asked me to work as a receptionist, which I did for 3 months in summer 1968 before returning to university, this time in Canada. After that I landed in Munich/Bavaria and have been here, more rural now, ever since. Now to Aveley itself, perhaps starting at the top and working down. After the Ordnance came the doctors' surgery. At one time I think there were 4 doctors and all with a name starting with B: Browning, Borland (a Bore, i.e. S.African). Then the old houses on the right where David Shelley lived, next to June GERKIN, opposite the Maltings? I think the hairdresser Wally DOE had a small shop on the left, opposite the post office, either before or after he had the bigger one in Ship Lane. His hair was always greased perfectly in place, and he had a fag in his mouth while he was doing you. If you tried to get something that looked more modern you still came away with short-back-and-sides. GERALD was his best hairdresser, I think. A big handsome fellow with black curly hair. READ's was an old-fashioned, really romantic looking shop when we were small: bay windows decorated for Xmas. The dairy was run by Mr and Mrs COLE. Elsie worked there for some time before going across the road to Pardy & Johnson and eventually becoming manageress. In those days the floors were wooden and they spread sawdust on them every day. And I remember seeing huge shire horses in the High Street, probably been working in the fields. We didn't go into The Ship much. I seem to remember that Michael O'CONNOR was in the Gazette once because he burgled it, and later he became the publican! Mr FRIAR (or was it TUCK?) sat in his dark little shoeshop. Then there was a fish shop, and WILSON - a ladies hairdresser? This is tiring, I think I'll have to stop there. A memory shared by Colin Newberry on Mar 25th, 2014. Send Colin Newberry a message. Great post !!! I remember all of those !! Born in Grange Road 1951. I lived at 128 High St Aveley, right next to Dr Borland, A Scot. The other side of us at 126 were the Shelleys, then the Girkins, then Franklands, Then Donald and Sonia Crawford, then Anne/Alice and Janice Wright, then Gwen Bradley, then the church hall, then Wakefields butcher, then the post office, then the entrance to the rec where all of the Army tanks and vehicles were parked just before the D-Day embarkation. The other side of Borlands lived Lenny and Brian Hermitage. Every year a group of we "Old-Aveley-ites" get together for lunch at the Prince Albert Pub, now a Chinese restaurant. With Donald Crawford, Ray and Anne Andrews, nee Wright, Derek Shelly, Eric Sach, We hope to get Maureen Osborne, John's wife, also Tony Poston, to the next gathering. 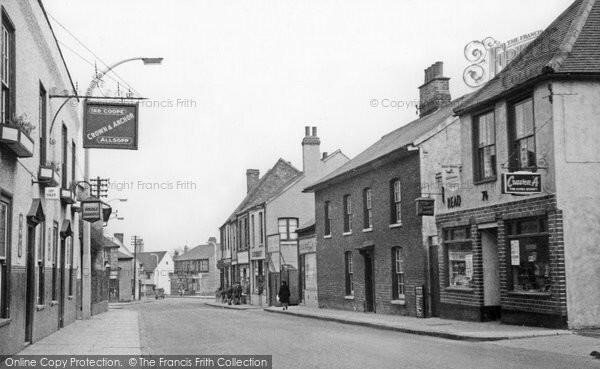 Many of us share memories on Facebook's site "Memories of Growing up in Old Aveley"
This one was cut off after "Roy and,,," Colin N.
Ken Girkin lived in the High Street next to David Shelley.